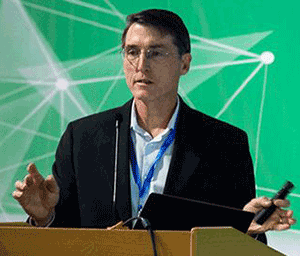 PNNL’s Jud Virden and Jun Liu delivered keynote presentations at the 5th International Renewable and Sustainable Energy Conference (IRSEC), held December 4-7 in Tangier, Morocco. The talks were part of a battery-focused workshop that featured speakers from the U.S., Chile and China. Virden, Associate Laboratory Director for Energy and Environment, spoke on “Battery Energy Storage Systems for Grid Applications—Results from the Field.” His presentation provided an overview of current technical and economic aspects of storage systems, and highlighted some of the deployments of large-scale batteries in the Pacific Northwest, representing both lithium ion and vanadium redox flow technologies. Those systems support a variety of grid applications, including arbitrage, regulation and load following. Virden delivered a similar presentation several weeks later at the 2018 Annual Meeting for the International Coalition for Energy Storage and Innovation in China. Liu, a Battelle Fellow at PNNL, presented, “Building the Next-Generation High-Energy and Low-Cost Batteries.” He discussed the challenges, requirements and practical technical approaches that have been identified to achieve more efficient next-generation batteries. As part of this, he also discussed emerging methodologies and new concepts in multi-functional materials and electrolytes. Liu serves as the Director of the DOE-funded Battery500 Consortium, which is working to develop a high-performance battery for electric vehicles that is reliable, safe and less expensive. 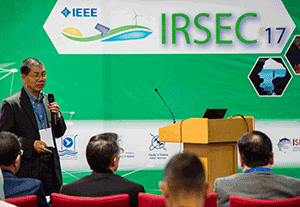 IRSEC is an international forum for discussion and knowledge exchange of state-of-the-art research findings in renewable and sustainable energy. The conference also focuses on current and future challenges in these fields, as well as opportunities. The meeting attracts participation from academia, industry and government, and this year the event featured a broad range of topics, including renewable energy technologies, energy efficiency, green energy, climate change, sustainable energy systems and smart grid.